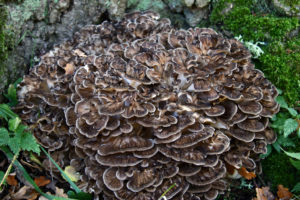 Maitake mushroom or also known as hen of the woods are a type of mushroom that has been eaten as food in Asia for thousands of years. They are very famous for their health properties. It’s also very tasty. In japan they are also known as the dancing mushroom. According to a Japanese legend, a group of Buddhist nuns and woodcutters met on a mountain trail, where they discovered a fruiting of maitake mushrooms emerging from the forest floor. Rejoicing at their discovery of this delicious mushroom, they danced to celebrate. In Italy, this species is known as signorina, or “the unmarried woman.” Today these two common names, bestowed long ago on the opposite sides of the planet, seem especially deserving and perhaps foretelling recent research findings. Because maitake mushroom is used to treat cancer and also to relieve some of the side effects of chemical treatment (chemotherapy) for cancer. It is also used for HIV/AIDS, chronic fatigue syndrome (CFS), hepatitis, hay fever, diabetes, high blood pressure, high cholesterol, weight loss or control, and infertility due to a condition called polycystic ovary syndrome. In other words this mushroom is pretty much medicine for many diseases. Because of it’s incredible taste and health promoting abilities this mushroom is in high demand. But growing maitake mushrooms aren’t easy without the proper know how. So here are a few easy steps on how to grow maitake mushrooms. Using a log is the best way to grow maitake mushrooms. It’s cheap and easier to get and you will get more mushrooms this way. Finding logs isn’t very hard as most places have them. Or you can also do some cutting yourself too if you’re up for it. Logs are a better option to grow mushrooms because with logs you have more space to grow mushrooms, and you are likely to get more mushrooms this way. Make sure the log is 3 feet in length and 6 inches in width. Then you have to drown the log in cold water and soak it for two hours. It’s better to use logs because the mushroom grown on logs are usually bigger than most. Next you have to get a spawn plug and some wax. Next you have to get a drill. When you have that you have to start drilling. Getting a drill isn’t that hard most stores have drills. You need to make sure to get a drill without any rust in it. Then you have to start drilling. The first thing you have to remember is that when you’re drilling you have to drill 25 to 30 holes in the log. The drill has to be fitted with 5 to 16 inch bit. The holes have to be 11/2 inches deep. Then you have to insert an oak dowel size of 1 inch that is inoculated with a mushroom spawn into the drilled holes. You can also use a hammer and use spawn plug and use your hammer to insert the spawn plug into the drilled holes. Or if you want to use an oak dowel you can purchase inoculated oak dowels from online purveyors or home and garden stores as part of maitake mushroom growing kits or separately in quantities of up to 1,000 and more. Tap the oak dowels in the holes with a rubber mallet. You also need to make sure that you have the right spawn plug. Maitake mushroom spawn plug usually look like a small wooden bullet or a small French bread. After that you need to get a wax. Wax can be found on almost any stores. It’s best to use cheese wax. You will also need something to heat the wax. You can use a lighter or even a frying pan. Once you’ve got your wax, you will need to start heating it. Try heating it on a saucepan on low heat. Brush the melted wax over the oak dowels with a pastry brush and allow it to cool and set. Then you need to make sure to apply the wax once more to ensure a good seal to prevent insects and other fungi from entering. You can also use a pot to heat the wax. First put the wax in the pot, then start heating it. Once fully heated it should be ready and the wax should be melted. Once the wax is melted you can use a brush to slowly brush over the melted wax and then cover the drilled holes with the spawn plug in it by brushing it. The melted wax will cover the hole and it should cool of pretty soon. And the holes will be covered and protected. The wax sealing helps keep the moisture in the log, and it also prevents other mushroom spawns from getting in there. Also it prevents any insects from getting into the logs as well. You can also cover the end of the logs as well, because it will help in keeping the moisture in the log. Now you have to take the log and set it aside. It will take at least 12 months before you get any mushrooms from the logs. But once they start producing the log will be covered with maitake mushrooms from one end to the other. It won’t necessarily come out from the holes they could come out from any of the cracks or holes from the log. And you will get a great amount of mushrooms and they will be fresh and delicious. And it’ll be mostly better than the stores. After this step is done next you have to make sure to put the log in the right place which will be discussed next. You need to put the log in a damp area outdoor. You have to place the log on two bricks so it does not touch the ground. Or you can also rest it upright against a wall. Keeping the logs on top of the ground without touching it prevents foreign mushroom spawn from colonizing. Water the log after two weeks intervals, the logs should be moist not wet at all times. After 6 months or a year the mushrooms will start growing. You can also soak the log in ice water for 24 hours which will shock the maitake spawn into growth if desired. After that return the log to its previous position. Finally after 12 months or a year you will start getting some fruit then you can harvest the fruits.